Thought I’d give you an update on the little Tomato plant you gave me! Here it is and you can see the little Sweet Basil plant I bought on Sunday planted next to it! I am amazed at how quickly the tomato has grown. It must be three times the size it was when you gave it to me. (wish all my plants grew that quickly!). They are both living in a little 1m² patch which is the only full sun patch in the whole garden. So I am hoping they thrive. So far so good. The tomato has been there for about two weeks and looks much happier than when she was in the pot and the basil plant has been there since Sunday. I am SO tempted to start a worm farm! 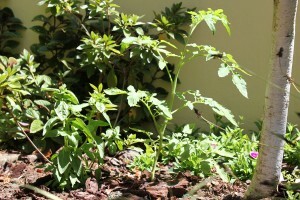 I found some info with photos the other day – a visual experiment with tomato plants over a certain time period – 3 plants, 1 fed with worm tea, one with commercial fertiliser and one with nothing … the worm tree fertilised plant was almost three times the size of the other two in no time at all! Hi Chris, well done!! They look stunning – you’ve picked a great spot there for them. You are going to have stunning tomatoes soon. The basil next to it will help it to thrive and make the tomatoes super. This is the perfect companion for your tomato plant. All I give mine is liquid fertilizer (Kelp) and Worm Tea. That is my experiment combination this year – just to see how little I have to do to keep them healthy. I have been reading in that wonderful book you gave me Companion Planting by Margaret Roberts and it is packed with great new plants I can use in my veggie patch to help all the vegetables grow together in harmony. I’ll update you as I go along. Perhaps take one plant a week for the blog. A question for you … should I fertilse the Tomato? What should I be doing to keep it happy?